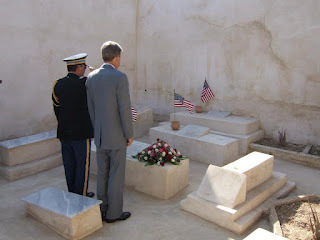 The September 11th assassination of US Ambassador to Libya Chris Stevens and three other Americans has added a new urgency to the repatriation of the remains of Richard Somers and the men of the U.S.S. Intrepid from Tripoli. Unlike other seemingly spontaneous protests at American embassies around the world, in response to the release of a movie insulting to Islamsts, the attack on the US consulate in Benghazi appears to have been planned in advance and carried out by hundreds of heavily armed militants. 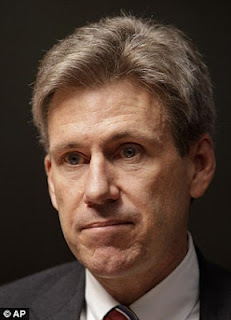 Shortly after the February 17th Revolution in Libya began, Chris Stevens was sent to Benghazi to evaluate the revolutionaries, determine who they were, what they were fighting for and why. His reports played a major role in the change in US policy of backing foreign dictators who support American economic, anti-Communist and counter-terrorist policies. The American support for the revolutionaries, along with the imposition of a NATO enforced no-fly zone over Libya, contributed greatly to the success of the revolution over the four decades long rule of Dictator Mommar Gadhafi. Stevens was respected and trusted by the many diverse elements of Libyan society, and was appointed ambassador in March, 2012. 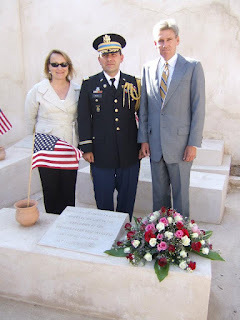 On Memorial Day, Stevens led the American delegation in a ceremony at the graves of the men of the USS Intrepid at Old Protestant Cemetery in Tripoli. Richard Somers commanded the captured pirate ship rechristened USS Intrepid on one of the first special operation raids in US Naval history on the night of September 4, 1804, intending to destroy the anchored enemy fleet in Tripoli harbor. The ship exploded before it could reach its destination and the bodies of the men were recovered on the shore and buried nearby. 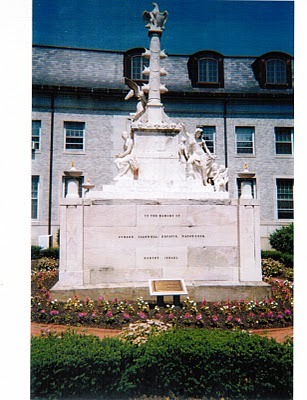 The Somers’ family, beginning with his sister Sarah, has always sought the return of the remains of Richard from Tripoli, and they have been joined by the family of Lt. Henry Wadsworth, Somers’ second in command and uncle of Longfellow the famed New England poet. With the backing of the citizens of Somers Point, and the endorsement of the New Jersey State Legislature, the House of Representatives and Veterans groups like the American Legion, VFW and Am Vets, an amendment to repatriate the remains was attached to the 2012 Defense Authorization Act. But that amendment was withdrawn by Sen. John McCain at the request of the Navy. Rep. Frank LoBiondo (R. NJ 2nd), a strong supporter of repatriation, and whose district includes Somers Point, reinserted an order to have the military study the feasibility of repatriation, a report that is due in October. Regardless of what that study concludes, those seeking repatriation have stepped up their efforts and consider this an emergency situation. “If we don’t get them out now, while we can, who knows what will happen to them? If the Islamic extremists get to them first, we will never get them back,” said Walt Gregory, who is helping to raise money to build a monument to Somers that they hope, will also be a gravestone if his remains are returned. Of the many diverse groups in Libya, the radical Islamics known as Salafists are orthodox Muslims who believe in a strict interpretation of the Koran, and are often at violent odds with other Islamic sects, especially the Sufis, who sing, dance and revere their honored Sufi saints. Shortly after the ouster of Gadhafi, some Sal fists intimidated a Libyan Jew who was trying to restore an ancient and abandoned Tripoli Synagogue. They also attacked some Sufi mosques, excavated the graves and made off with the remains of some Sufi saints that had been buried in the floor of the mosque for over a hundred years. More recently some Salafists bulldozed a Sufi mosque in Tripoli, completely pulverizing it, without any objections from the ruling interim government, who consider it a religious affair. These same Salafists Moslems are leading the protests against American embassies and businesses in the Middle East and Asia, and it is believed by intelligence analysts that these protests were used as a cover for the attack on the US consulates in Benghazi and Tripoli by Al Qada and Taliban forces. These Taliban, who practice a strict form of Salafist Islam, were responsible for the destruction of two centuries old Budda statutes in Afghanistan, because they insulted their Islamic sensibilities, and desecrated the graves of British soldiers who died during World War II and are buried in Libya. These same radical Islamists would certainly attack, desecrate and remove the remains of the American naval heroes buried in Tripoli if they knew where they were, as the graves are clearly marked as Americans from the USS Intrepid. Hastings also said she fears the cemetery in which the American remains lie could suffer the same type of desecration as the Commonwealth Cemetery near Tobruk, Libya. A mob destroyed numerous graves of soldiers who died in battle in World War II and ripped up Australian, British and New Zealand flags when it attacked the cemetery earlier this year. The part of the 2012 Defense Authorization Act that refers to the repatriation of Somers and the men of the Intrepid refers to “the proposal to exhume, identify, and relocate the remains of the American sailors.” It concerns the “Evaluation of Issues Affecting Disposition of remains of American Sailors Killed in the Explosion of the Ketch USS INTREPID in Tripoli Harbor on September 4, 1804,” and requires a report to be conducted by the Secretary of Defense and the Secretary of the Navy and issued by October. Donations for the Somers Monument can be made to the Somers Point Historical Society and sent to P.O. Box 517, Somers Point, N.J. 08244 or at their web site: . Since they died for the same principles – freedom, liberty and justice, the names of Chris Stevens, Sean Smith, Glen Doherty and Tyrone Woods should be added to the Tripoli Monument at Annapolis, America’s first war memorial dedicated to the US Navy officers who died during the first war against the Barbary Pirates. Stevens - the American hero of the Libyan Revolution, was a Peace Corp veteran and a dedicated diplomat who was sent into Benghazi to size up the revolutionary forces. Arriving in the hold of a cargo ship, he met with all of the rebels, and breaking with the long held policy of backing dictators who support US economic, anti-communist and counter-terrorist policies, Stevens came down squarely on the side of the revolutionaries. He helped begin the political process that led to the US-NATO intervention, the establishment of the no-fly zone and saving the city of Benghazi from total destruction, as Gadhafi had done to other Libyan cities. While most critics, mainly on the liberal left, decried the support of the rebels as an extension of the American war program as exercised in Iraq and Afghanistan, Stevens saw it in its proper historical context – the fight for liberty and freedom that went back over 200 years. With the success of the revolution, Stevens was named the new US Ambassador to Libya, and was recognized as a true friend of the new Libya. One of the first public events Stevens did as ambassador was a Memorial Day 2012 ceremony at the graves of the American sailors from the USS Intrepid. The USS Intrepid, a captured pirate ship, was used in a number of daring commando raids, that preceded the establishment of such special operations units like the Army Rangers and Navy SEALS. One mission on the Intrepid sank the captured frigate USS Philadelpha in Tripoli harbor. Then the Intrepid was converted into a fireship and sailed into Tripoli harbor at night with the intention of destroying the anchored pirate fleet. Instead the ship blew up prematurely and killed all thirteen men, including the commander, Lt. Richard Somers. Their remains were recovered and buried just off the beach near the old castle fort at Martyr’s Square, the epicenter of the Libyan revolution. The only real martyrs buried at Tripoli’s Martyr’s Square are US Navy heroes killed fighting tyranny over two hundred years ago. Although these men were killed in action during the battle immortalized in the US Marine hymn, “to the shores of Tripoli,” Stevens felt a personal affiliation with them, and in a sense, helped complete their mission. The situation in 1804 was not that much different than it is today, as pirates were marauding American merchant ships off Africa and enslaving and ransoming their passengers and crew. When tribute payments stopped, Yousef Karamanli, the chief pirate and tyrant of Tripoli, declared war against the United States by chopping down the flag pole outside home of the US counsel. With the slogan of “Millions for defense but not once cent for tribute,” Americans decided to build a navy and fight the pirate, rather than pay the tributes and ransoms. 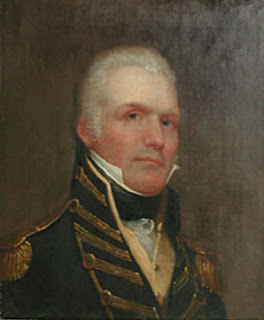 Commodore Edward Preble led the American fleet in a blockade of Tripoli harbor, while William Eaton, the US Counsel to Egypt, convinced Hamid Karamanli, the deposed brother of the tyrant, to reclaim his kingdom. With Sergeant Presley O’Bannon and a squad of eight US Marines, a few hundred Greek Christians mercenaries and a cavalry of Bedouin tribesmen, the motley army marched across the desert and captured the eastern port city of Derna, much like Lawrence of Arabia captured Akaba. After repelling a loyalist counterattack, Eaton, Hamid Karamanli, O’Bannon and their makeshift army, similar in their diversity to the 2012 revolutionaries, prepared to march on Tripoli. But before they did, another US diplomat, Tobias Lear accepted a peace treaty with Yousef Karamanli, paying him $60,000 ransom for the 300 US Navy prisoners from the captured frigate USS Philadelphia. Paying the ransom was not only against the declared US policy, it also left Yousef Karamanli in power. When they learned of the treaty, Eaton, Karamanli, O’Bannon and the marines had to sneak out of Derna at night by boat and abandoned their army, much like the Cubans were abandoned at the Bay of Pigs. But in appreciation for fighting with him, Hamid Karamanli gave Sgt. Presley O’Bannon his Mamaluke sword, which was adopted as the official dress sword of the U.S. Marines. Over a hundred and fifty years later, in 1949, present at an official ceremony at the graves of the men of the USS Intrepid, was Youself Karamanli, the mayor of Tripoli, namesake and direct descendent of the tyrant who was the first to declare war against the United States. From 1949 until Gadhafi seized power in 1969 the Tripoli graves of the men of the Intrepid were maintained by the Officer’s Wives Club of Wheelus Air Force. It wasn’t until Gadhafi renounced terrorism, paid off the victims of the Lockerbie bombing and turned over his weapons of mass destruction that US diplomats returned to Tripoli. And one of the first things they did was to conduct a ceremony at the graves of the Intrepid sailors and convince the Gadhafi government to restore the historic Old Protestant Cemetery. In the meantime, the family of the Intrepid’s commander Lt. Richard Somers of Somers Point, New Jersey petitioned the US Navy to repatriate the remains of Somers and his men, an effort that was joined by the family of the Intrepid’s second in command, Lt. Henry Wadsworth, uncle of Longfellow. Their efforts led to the inclusion of an article in the 2012 Defense Appropriation Act requiring the military conduct a feasibility study of repatriation of the remains of these men, a study that is due soon. Shortly after the restoration of the cemetery, Secretary of Defense Leon Panetta visited Tripoli and stopped by the Intrepid graves to pay his respects to the American heroes buried there. Then after the Arab Spring revolutions began in Tunisa and forced the outster of a number of dictators, the Gadhafi government arrested a Benghazi lawyer who represented over one thousand families of political prisoners Gadhafi had executed in one day. On February 17, 2010, less than one hundred, mostly women protested the arrest of their lawyer in Benghazi, a protest that, while it led to the release of the attorney, was joined by others, and the Libyan revolution was on. While the US government officially supported Tunisia’s Ali, Mubarak of Egypt and Gadhafi, as they had agreed to support US economic and counter-terrorism policies, Chris Stevens was sent in to evaluate the rebels and find out who they were and what they represented. His reports greatly influenced US policy makers, especially Secretary of State Hillary Clinton,and the decision was made to forgo support for Gadhafi and back the rebels instead. It was a decision made at the same time Gadhafi’s military forces were about to level Benghazi, as they had other rebellious towns and cities. This change in US policy, from support of friendly dictators to backing the democratic revolution to overthrow them, is a major change in American policy, and one that should be upheld in other countries controlled by dictators. Stevens didn’t give his life for NATO, the UN or the Arab League, he died for the freedom, liberty and justice for the Libyan people – the same reasons that Richard Somers and the men of the Intrepid died, fighting the tyranny of Yousef Karamanli. In recognition of the fact that Americans fight today for the same reasons that they fought for two hundred years ago, freedom – liberty – justice and democracy - the names of Chris Stevens, Sean Smith, Glen Doherty and Tyrone Woods should be added to the names of those American heroes that are inscribed on the Tripoli monument, and the remains of the Naval heroes who are still buried in Tripoli should be repatriated home and buried in a safe and secure location where radical Islamic terrorist can’t desecrate their graves. First let me thank you for your service to our country during the Libyan revolution, and congratulate you on your well deserved appointment as Ambassador. I also wish you well in the even more difficult task of guiding American interests and policy while a new society and government are established. My interests in Libya began while researching and writing this book – “300 Years at the Point – A History of Somers Point, New Jersey” – which includes a chapter on Master Commandant Richard Somers, USN, who gave his life in the service of his country while leading the Intrepid expedition into Tripoli harbor. He is currently buried on the Shores of Tripoli, possibly among the remains at the historic Old Protestant Cemetery. The Somers family, led by his sister Sarah and continuing into the present generation, has always sought the return of his remains, a request that has been joined by many of the citizens of Somers Point and the State of New Jersey, as well as the family of Somers’ second officer, Lt. Henry Wadsworth, uncle of Longfellow. As you know, the 2012 Defense Authorization act requires the military to undertake a study to determine the feasibility of repatriating the remains of these men, when all we ask is that they be treated like any other American killed in action on foreign soil, and if they can be identified, to submit to the will of the family as to where they should be buried. Whatever is the outcome of this matter, I would like you to consider visiting Somers Point, N. J. sometime. As you will see if you peruse my book, Somers Point, is a small, historic American port town with direct and continuing ties to Tripoli, whose native son is buried there, and so could be an appropriate place for you to give a report on the revolution and the current situation in Libya. SOMERS POINT – If this town had a favorite son, it would be Capt. Richard Somers, who is honored here in a ceremony each year. Richard Somers Day will be observed 2 p.m. Sunday, Sept. 9 on the grounds of Somers Point City Hall, 1 W. New Jersey Ave. In case of rain, the event will be moved to Council Chambers inside City Hall. 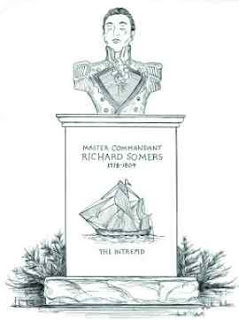 Somers is remembered for his bravery in battling the Barbary pirates. While captaining the U.S.S. Intrepid, Somers died alongside 12 crew members when their explosive-laden ship prematurely detonated in Tripoli Harbor, Libya on Sept. 3, 1804. The men were buried in mass and unkempt graves in Tripoli and the return of their bodies has been a controversial topic to this day. Despite his tragic end, the tale of Somers begins here at Somers Mansion which overlooks the Great Egg Harbor, which by many accounts is the body of water where Somers first learned to sail. Since Somers’ death 208 years ago he has been memorialized throughout the nation. Last July, officials here met with those from Somers, N.Y. located in Westchester County and named for Somers in 1808. Currently, the Somers Point Historical Society is undergoing a campaign to create a monument in the park adjacent to the Atlantic County Historical Society on Shore Road. Its most prominent feature, according to historical society president Sally Hastings, is a bronze bust of Somers, a duplicate of one currently on display in Somers, N.Y.
Hastings said Wednesday the society is 45 percent toward its goal of $35,000 for the monument. She said in recent history, Bill Kelly’s book, “300 Years at the Point,” and groups like Liberty and Prosperity have put Somers back in the spotlight. Hastings said it was Somers’ courage that appeals to her. Hastings is also the director of the Intrepid Project which has sought to re-patriot the remains of Somers and his crew. In January, U.S. Rep. Frank A. LoBiondo (R-2nd) lauded an amendment he sponsored to the National Defense Authorization Act which instructs officials from the Navy and the Department of Defense to conduct a feasibility study into returning Somers’ and his fellow Navy commandos. Hastings said he expects those results early next month. “He’s not forgotten. It’s amazing more than 200 years later he is still remembered. He’s been greatly honored in our country for hundreds of years and there’s still a lot of Somers descendents that live in this area,” Hastings said. She noted that seven ships in this country’s naval history have been named U.S.S. Somers and another four named U.S.S. Intrepid. To aid the monument fundraising effort, there will be a wristband day 1-5 p.m. Saturday, Sept. 22 at Playland's Castaway Cove, 10th Street and the Boardwalk in Ocean City. Wristbands are $10 for unlimited rides. There will also be a Somers Point Historical Society booth at Good Old Days on Saturday. The program is co-sponsored by the City of Somers Point, the Somers Point Historical Society, and Liberty and Prosperity. Tours of Somers Mansion and the Somers Point Historical Museum are available preceding and following the program. Call the Somers Point Historical Society (609) 927-2900.